The Fern Grotto and Wailua River Tour is the only one of its kind. With Wailua River Tours, you’re able to explore the majestic Fern Grotto in Kauai, which is not able to be accessed any other way. Wailua River Cruises give you a chance to check out Smith’s Fern Grotto; these tours are great for the entire family. Fern Grotto Tours fill up early throughout the year, so be sure to reserve your spot as soon as possible. When you book your Fern Grotto River Tour through Top Ten Hawaii, you’re sure to save both time and money—and you’re sure to create lasting memories! During Wailua River Tours, you’ll be able to learn about the legends and history of those ancient civilizations that once inhabited the island. Visiting the Fern Grotto in Kauai is the ideal way to get in touch with Hawaii’s past. Smith’s Fern Grotto Wailua River Cruise is the only choice for checking out the Fern Grotto in Kauai. Fern Grotto Tours follow the Wailua River alongside water skiers, motorboats and kayakers. While en route during the Fern Grotto River Tour, you’ll come in contact with an abundance of photo opportunities, particularly of the stunning grasslands that line the river. 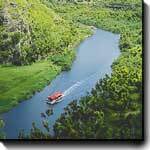 Top Ten Hawaii’s Wailua River Tour also travels past the awe-inspiring Mt. Waialeale in the background. The Fern Grotto in Kauai is situated at the base of the Maunu Kapu Mountain, the gorgeous peak that towers over the southern bank of the Wailea River. Geologists report that the Fern Grotto was created millions of years ago. You’ll be blown away by the tropical plants and rainforest atmosphere that surrounds you during these Wailua River Cruises. Smith's Fern Grotto has run their motorboat service since the late 1940s. Walter Smith brought the very first group of visitors on the Fern Grotto Tour, and a tradition was born. Since then, the Fern Grotto River Tour has been the only way to check out this stunning site. When you’re booking your activities for your Hawaiian vacation, don’t forget to ask about Wailua River Tours and Fern Grotto Tours offered through Smith’s Fern Grotto.